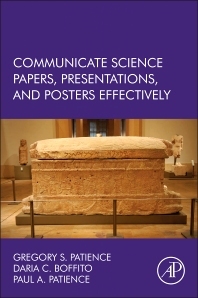 Communicate Science Papers, Presentations, and Posters Effectively is a guidebook on science writing and communication that professors, students, and professionals in the STEM fields can use in a practical way. This book advocates a clear and concise writing and presenting style, enabling users to concentrate on content. The text is useful to both native and non-native English speakers. The book includes chapters on the publishing industry (discussing bibliometrics, h-indexes, and citations), plagiarism, and how to report data properly. It also offers practical guidance for writing equations and provides the reader with extensive practice material consisting of both exercises and solutions.